1 Brother Bee snored. He was fast asleep. His friend Green Fly came by. Green Fly woke him up. 2 Green Fly said, "Come on. Let's go to the game!" 3 Brother Bee yawned. He told Green Fly, "Don't bug me!" 4 "You've never been to a game," Green Fly said. "It will be fun! Trust me!" 5 Brother Bee pretended to sting his friend. "All right. I will go," he said with a grunt. "Do we have to walk far?" 6 Green Fly rolled his eyes. He waited for Brother to take a quick bath. 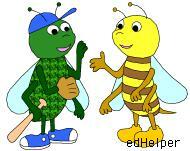 Then Green Fly and Brother Bee walked to the park. They passed a truck and a wishing well. 7 "I hope they win," wished Green Fly. 9 "My team, silly!" said Green Fly.